The common alder (not to be confused with the Elder tree Sambucus nigra) is found all over Europe and also in Siberia and North Africa. The common alder grows by open water - from mountain streams to lowland fens. It reaches a height of 25m. 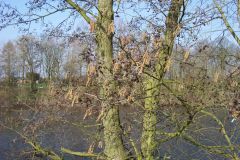 The male catkins of the common alder grow in clusters of 3 to 5 maturing from dull purple to dark yellow and up to 5cm long. The female catkins are present all year in short erect clusters. These 5-6cm long dark red catkins mature into green egg-shaped cones from 8 to 15cm long, which then become dark brown and woody when they are ripe. The common alder's wood is strong but easily worked and durable under water. It is therefore often used for barrels and pipes. It is also used for toys, broomheads and paper pulp. This alder is often planted to conserve river and lake banks and also improves the fertility of the soil. The grey alder (Alnus incana) is similar to the common alder, but can be distinguished by it duller leaves which are sharply pointed and strongly toothed. The common alder has oval leaves with a pointed base, rounded tip and wavy or toothed margins. The gey alder grows better in dry soils and is often planted where old rubbish tips or similar places are being reclamed. The alder is one of the birch family. This page copyright © 1998 to 2005 Derek J. Carr, United Kingdom. All rights reserved.